It’s Follow-Up Friday: Schools and Spheres edition! And today, I’d like to return to the subject of Kickstarter philanthropy! 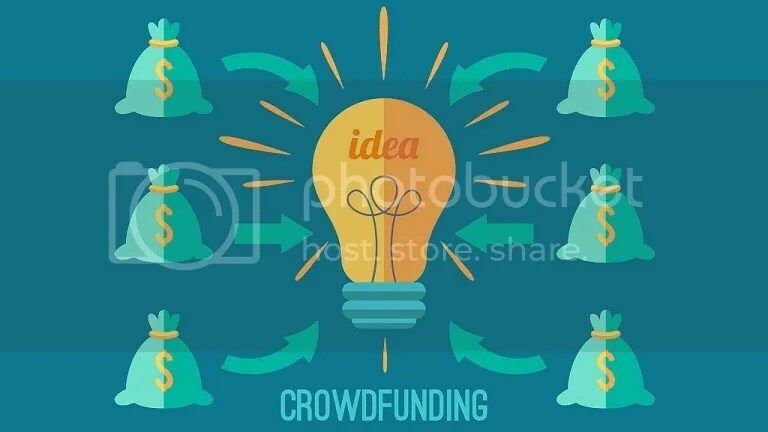 I’ve written about crowdfunding a lot in this blog, because over the last few years, platforms like Kickstarter and Indiegogo have changed how many puzzles and games are created, funded, and brought to market. There’s a virtual board game and card game renaissance stemming from these websites, and many puzzle constructors are bypassing traditional publishing formats and taking their puzzle suites and projects straight to the audience this way. But there’s also the opportunity to give back to your community in meaningful ways. I recently stumbled across the Kickstarter campaign for StrataSphere, a strategy puzzle game from Family Games America that really caught my eye. 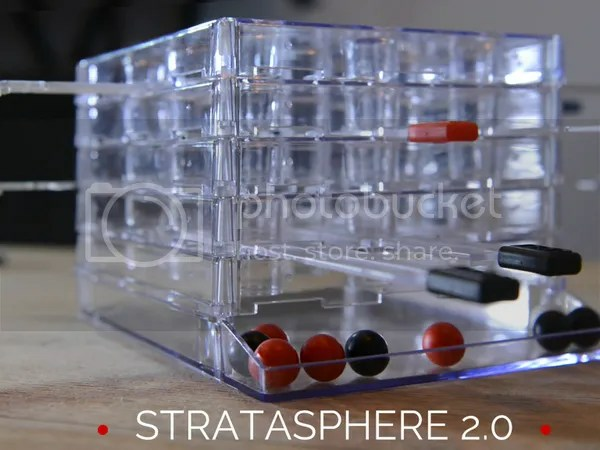 Like a next-level version of Connect Four and KerPlunk, StrataSphere challenges you to place your sliding tabs in various slots around the cube, then use them to drop your spheres to the bottom layer first. 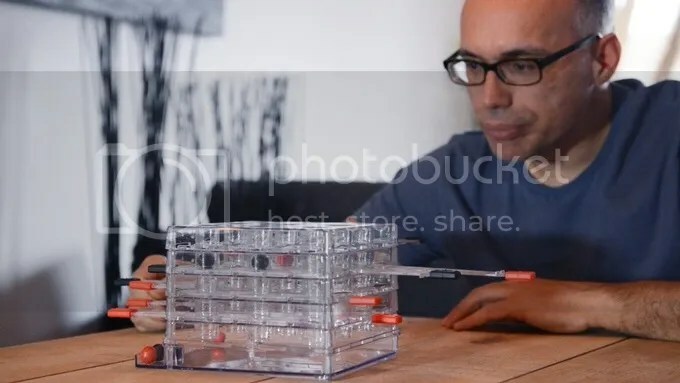 But what most intrigued me about the project wasn’t the puzzle itself, but one of the crowdfunding options being offered. Instead of just pledging for a copy of the game for yourself, you could pledge a little more money and donate a copy of the game in your name to a school of your choosing. Puzzle philanthropy. I reached out to the team at FGA to find out more about the project, and had the opportunity to chat with Paulette Hall, communications director for FGA. Where did the idea for StrataSphere come from? The game was originally envisioned and developed by German designer Claudia Herz, who originally named it BallCube. Claudia remembers that after spending time sketching and offering the idea to other game publishers she finally made a handmade sample of acrylic glass and presented it at a trade-show not too far from her home. The reaction and feedback was overwhelming. People wanted to know everything about the game and know where it can be purchased. This is what encouraged her to pursue the project. With a combination of inspiration from Claudia and outer-space, we renamed the game StrataSphere 2.0. For people unfamiliar with FGA, what sort of puzzles and puzzle-games are your bread and butter? Is StrataSphere a traditional FGA-style puzzle, or is it a new direction for you? FGA’s tag-line, Learning Through Laughter, has been been incorporated into all of our gift, game, and puzzle products since being established in 1987. StrataSphere 2.0 is not so much a puzzle but a strategy tabletop game that is a more contemporary modern addition to our line of products. Our more popular items include eco-friendly wooden games and puzzles like Cathedral, Don’t Break The Bottle, and our wood and wire puzzles. While this strategy game is new to FGA, FGA is not new to strategy games. The option for supporters to donate an additional copy to a school of their choosing is one I’ve never seen before, and I’m surprised more Kickstarter campaigns haven’t utilized it. Is this the first product that has incorporated this sort of program? Is this a long-term goal for FGA going forward? FGA helped raise funds for actor Ted Danson’s American Oceans Campaign in the late ’80s and early ’90s with their environmental games and puzzles such as Endangered and Colorful Kingdom. A percentage of sales was also given to the ASPCA. Donations of FGA products go out yearly to schools and organizations. A big part of FGA is our ability to give back, and we wanted to start 2016 with a campaign that will help us continue to do that. Our students are our future, and the state of our school systems has geared our focus of this campaign to get valuable learning material back into our schools and into their hands. I think this is not only a really exciting puzzle game, but a worthwhile cause as well. You can check out all the details on the StrataSphere Kickstarter page. They’re more than halfway to their funding goal, and I sincerely hope they make it there and beyond.